In a small bowl, whisk the cornstarch with the lemon juice and 2 tablespoons of the wine. Rub the inside of a small enameled cast-iron casserole or saucepan with the cut garlic clove. Add the remaining 3/4 cup plus 2 tablespoons of wine and bring to a simmer over moderate heat. Slowly whisk in the cornstarch mixture and simmer, whisking constantly, until slightly thickened, about 1 minute. Reduce the heat to moderately low and add the cheeses in batches, spooning the Époisses directly out of its rind and into the pot, whisking constantly, until each addition is melted before adding more and the fondue is smooth, about 5 minutes. Some small, edible pieces of rind will remain. Stir in the Kirsch or Cognac, if using. 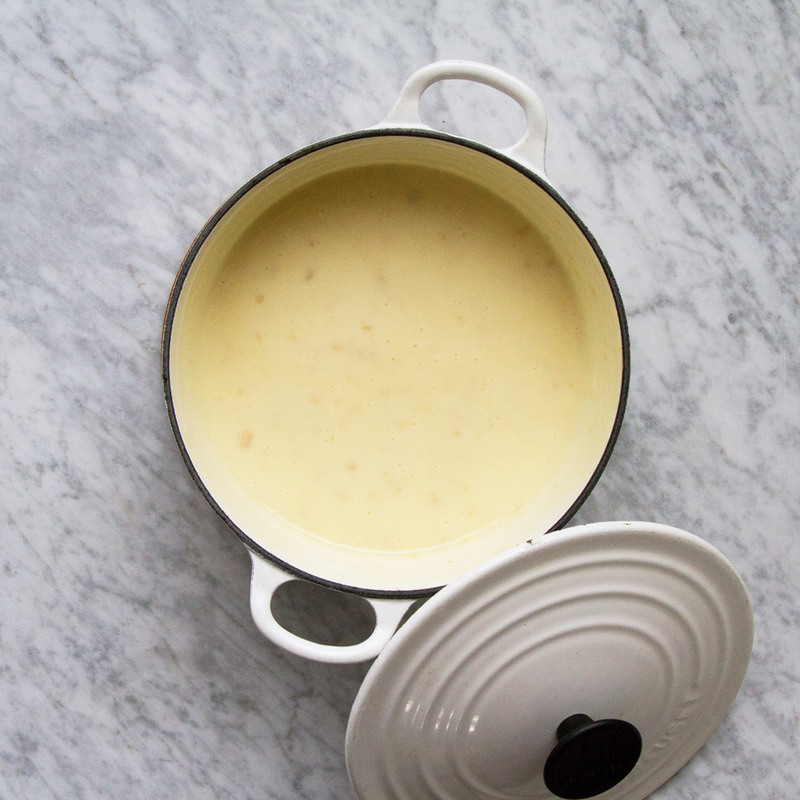 Serve immediately in the casserole or a warm fondue pot (see Note). The fondue can be refrigerated overnight and reheated gently on the stove over very low heat. If using a fondue pot for serving, fill it with hot water and let stand, covered, for 5 minutes. Drain and dry thoroughly immediately before adding the cheese fondue. Pieces of crusty bread, blanched or roasted vegetables, endive spears, thinly sliced apple, dried apricots, dates, root vegetable chips, sliced salumi (preferably something smoky, like dried chorizo), pickles. Review Body: Cheese fondue is the best! I will definitely have to try this recipe!